Teachers want their students to create, but don’t want to fight with clunky technology. Listening skills and learning can be improved with podcasting. Today’s show will help you understand one of the simplest technologies to use in the classroom: podcasting. Podcasting sparks imagination, creativity, and builds listening skills. Just about any teacher with a smartphone and an internet connection can have their students podcasting quickly! In this episode, Tom Daccord and I discuss how to using podcasting in the classroom. Welcome to episode 298 of the Every Classroom Matters podcast. How is podcasting being used in the classroom? How can students publish podcasts for the world? What kind of impact can podcasting have on learning? How can you use podcasts to improve listening skills? Listenwise is a fantastic way to use podcasts in your classroom and improve listening skills at the same time. I like that you can search by standard and topic (they have a ton of great books like A Wrinkle in Time, Beowulf, and Catch-22 as just a few listed this week. These podcasts aren’t a reading of the book, but relate the topics to the real world! Check Them out! An educational technology speaker, instructor, and author, Tom Daccord @thomasdaccord is Director of EdTechTeacher and has worked with schools, colleges and educational organizations in the United States, Canada, Europe, Asia, and the Middle East. 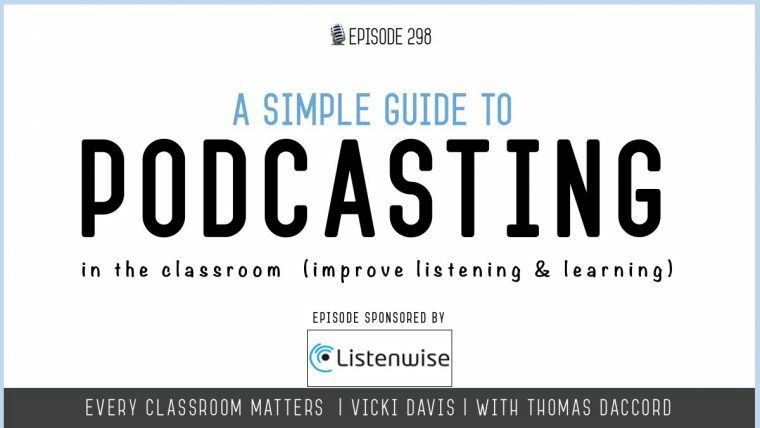 The post A Simple Guide to Podcasting in the Classroom appeared first on Cool Cat Teacher Blog by Vicki Davis @coolcatteacher helping educators be excellent every day. Meow!